Derby Owners Club 2000 Version 2 Naomi Cartridge from Sega. This game is a horse racing simulator which involves raising a horse, training the horse, and racing the horse. During Derby Owners Club 2000, the player takes on the role of owner, trainer, and jockey of their horse. Players can race your horses against other computer AI horses or other players also competing. Depending on where your horse finishes, you will win be awarded a purse. Players also have the option of training their horse in certain areas and so their abilities will increase. 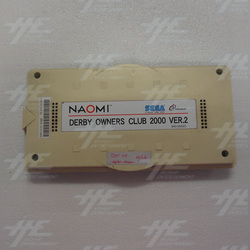 Derby Owners Club 2000 Version 2 Naomi Cartridge from Sega. This game is a horse racing simulator which involves raising a horse, training the horse, and racing the horse. During Derby Owners Club 2000, the player takes on the role of owner, trainer, and jockey of their horse. Players can race your horses against other computer AI horses or other players also competing. Depending on where your horse finishes, you will win be awarded a purse. Players also have the option of training their horse in certain areas and so their abilities will increase.